We are famous for our British summers aren’t we? Rain, sunshine and more rain! But our keep calm and carry on attitude gets us through as will our fabulous new range of casual dining sets, perfect for eating, entertaining and watching the sun going down. Whatever the weather the beauty of our outdoor furniture is that it can be left outside all summer long, come rain and shine. Fantastic for family get-togethers, birthday parties, romantic evening meals and leisurely breakfasts, simply re-arrange on the patio in the formation that best suits your occasion and enjoy al-fresco dining to the max. The beauty of modern materials is that they look like a traditional design but are actually built to endure years of British summers! 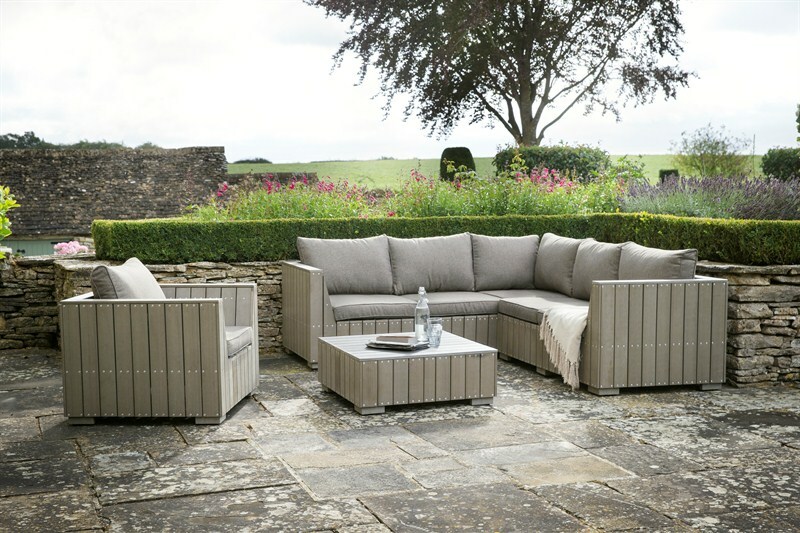 Our Bosham Corner Sofa Set is manufactured from polywood, a timber-styled material that is made from recycled plastic, not only it is perfect for all weathers but it is environmentally friendly and requires no maintenance either! The showerproof cushions partner the driftwood style furniture beautifully and will make any patio the envy of the Jones’! If it’s more of a rattan furniture you prefer then why not go for a PE rattan? This really is the new kid on the block as far as outdoor furniture goes. It looks like natural rattan but is UV resistant and weatherproof and our Lolsworth Corner Sofa Set comes complete with showerproof linen-look cushions too. With your artistic flair running free why not spruce up your patio area and add some decorative pots and containers to make it a real showpiece, big pots full of colour work well against large pieces of furniture whilst smaller pots really come into their own when dotted against walls or used as a table centrepiece.